Mid-weight hemp and organic cotton stretch leggings are perfect for everyday wear in class and out and about. 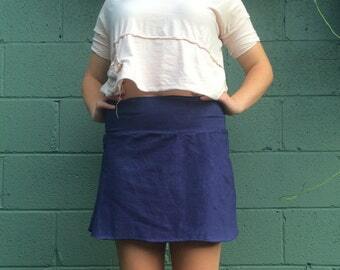 The attached mini skirt adds a sassy yet subtle flair. These leggings accentuate your curves while hugging in your tummy and covering your booty so you can feel comfortable and stylish in any environment. They are cut at 26" which comes to the ankle on a 5'4" 128 lb. woman. If you would like them longer, please make a note of it when you check out. In 12+ available colors, these leggings can accompany many pieces of clothing already in your closet. All Surya Leela clothing are made to order using the highest quality organic and sustainable fibers for an ideal fit and feel.